Twitter has given new meaning to the term “breaking news.” When I want up-to-the-second national and local headlines, instead of clicking “refresh” on CNN or PhillyBurbs, I now log in to Twitter. Why? Journalists are now tweeting while news is breaking. It may take time to break a news story, but a 140-character Twitter update takes 2 seconds and members of the press can even include a URL link when the full story breaks. In that respect, Twitter is a lot like RSS feed or Google Alerts, it allows you to narrow your news consumption to topic-specific areas. You can follow NY Times health news but not business news, all breaking news, and even all the news that’s fit to print…or Tweet, if you so choose. What really sold me on Twitter from a professional stand point was a Tweet from a local news outlet this morning. They were searching for local news stories on how Philadelphia Phillies fans were celebrating last night's World Series victory against the Tampa Bay Rays. For a public relations practitioner, this would be a perfect opportunity to cultivate a relationship with a member of the media if you knew of a client or colleague who had a relevant and interesting story. Helping out a member of the media with a news story even if it’s not news you intended to pitch could result in a long term relationship and favorable coverage in the future. An obvious public relations perk to Twitter is the opportunity to release product or company news. Tiny URL makes it easy to remain within the 140 character limit and also inform consumers of product releases, new hires and even fun company news to help establish your company’s personality. 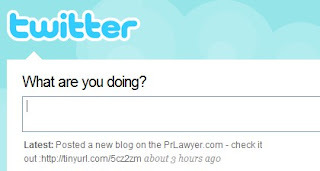 See The PR Lawyer’s previous post on Twitter and customer relations for more on this topic. Twitter is also a great way to keep up with friends and family, pop culture, (Stephen Colbert and Borat Tweet regularly) hobbies and more. If you’re interested in politics, technology, cooking, movies, etc., Twitter is an excellent tool to use to stay connected in those areas. It’s also a great way to plan your weekend, as many city newspapers and events websites will have their own Twitter handle to list upcoming events. Essentially, Twitter is what you make of it. Even if you choose not to Tweet, following other Twitterers is a great way to stay in the know, both professionally and personally.